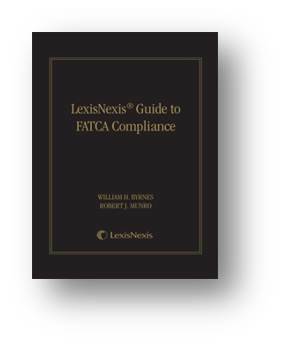 Professor William Byrnes is the primary author of LexisNexis’ Guide to FATCA Compliance. The 2nd edition features 600 pages of compliance analysis with practical examples, broken into 34 chapters, contributed by 50 experts from within financial institutions and large firms, and from interviews with tier 1 banks, trust company service providers (TSPs), and insurance companies. The Tax Division of the Department of Justice > released a statement on December 12 < strongly encouraged Swiss banks that want to seek non-prosecution agreements to resolve past cross-border criminal tax violations to submit letters of intent by the Dec. 31, 2013 deadline required by the Program for Non-Prosecution Agreements or Non-Target Letters for Swiss Banks (the “Program“). The Program was announced on Aug. 29, 2013, in a > joint statement < signed by Deputy Attorney General James M. Cole and Ambassador Manuel Sager of Switzerland (> See the Swiss government’s explanation of the Program < ). Switzerland’s Financial Market Supervisory Authority (FINMA) has issued a deadline of Monday, December 16, 2013 for a bank to inform it with its intention to apply for the DOJ’s Program. Swiss banks that have committed violations of U.S. tax laws and wish to cooperate and receive a non-prosecution agreement under the Program, known as Category 2 banks, must submit a letter of intent by Dec. 31, 2013. To be eligible for a non-prosecution agreement, Category 2 banks must meet several requirements, which include agreeing to pay penalties based on the amount held in undeclared U.S. accounts, fully disclosing their cross-border activities, and providing detailed information on an account-by-account basis for accounts in which U.S. taxpayers have a direct or indirect interest. Providing detailed information regarding other banks that transferred funds into secret accounts or that accepted funds when secret accounts were closed is also a stipulation for eligibility. The Swiss Federal Department of Finance has released a > model order and guidance note < that will allow all other Swiss banks to cooperate with the DOJ and fulfill the requirements of the Program. The DOJ’s November comments respond to such as issues as: (a) Bank-specific issues and issues concerning individuals, (b) Choosing which category among 2, 3, or 4, (c) Qualifications of independent examiner (attorney or accountant), (d) Content of independent examiner report, (e) Information required under the Program – no aggregate account data, (f) Penalty calculation – permitted reductions, (g) Category 4 banks – retroactive application of FATCA Annex II, paragraph II.A.1, and (h) Civil penalties. The DOJ reported that in July 2013, Liechtensteinische Landesbank AG, a bank based in Vaduz, Liechtenstein, entered into a non-prosecution agreement and agreed to pay more than $23.8 million stemming from its offshore banking activities, and turned over more than 200 account files of U.S. taxpayers who held undeclared accounts at the bank. Two court orders entered in November 2013 in a New York federal court will further aid these investigations by authorizing the IRS to serve what are known as “John Doe” summonses on five banks to obtain information about possible tax fraud by individuals whose identities are unknown. The John Doe summonses direct the five banks to produce records identifying U.S. taxpayers holding interests in undisclosed accounts at Zurcher Kantonalbank (ZKB) and its affiliates in Switzerland and at The Bank of N.T. Butterfield & Son Limited (Butterfield) and its affiliates in Switzerland, the Bahamas, Barbados, Cayman Islands, Guernsey, Hong Kong, Malta and the United Kingdom. The summonses also direct the five banks to produce information identifying foreign banks that used ZKB’s and Butterfield’s correspondent accounts at the five banks to service U.S. clients.